With the 10th anniversary of the Hawaii Geek Meet coming up, we were more than overdue in redesigning our website at HawaiiGeek.com. In fact, it would be overly generous to describe our original website as having a design at all! 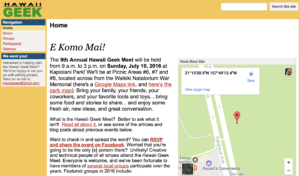 The new Hawaii Geek Meet site is still under construction, so please pardon any broken links, weird formatting, or other random behavior. But the most important information — the where and when — should always be easy to find! We look forward to seeing you on Sunday, July 2, 2017 at Magic Island (Picnic Area #39, closer to the parking lot and beach than in years past)! The event runs from 9 a.m. to 3 p.m. officially, but as always, what matters most to us is that you come, whenever you can! Goodbye, original site! Hello, modern web!